So far, City Hall has watched passively as New York State DOT plows forward with a plan to cut off Hunts Point from the Bronx River with new Bruckner ramps. But the mayor still has leverage at his disposal, if he wants to use it. The state DOT plan calls for highway ramps on Edgewater Road abutting the Bronx River and flying over part of Concrete Plant Park. New York State DOT wants to build highway ramps between the Hunts Point neighborhood and the Bronx River waterfront, and the last best chance to get the state to change course rests with Bill de Blasio. The mayor has multiple veto points at his disposal to check the state DOT and steer the project toward the ramp placement that neighborhood advocates prefer, which would channel truck traffic away from the residential heart of Hunts Point. But so far City Hall says only that the mayor is evaluating his options. At issue are ramps to connect the Bruckner Expressway to the massive Hunts Point Food Market. As part of a broader plan to turn the Sheridan Expressway into a surface street, the state DOT has proposed Bruckner ramps on Edgewater Road to maintain truck access to the market. 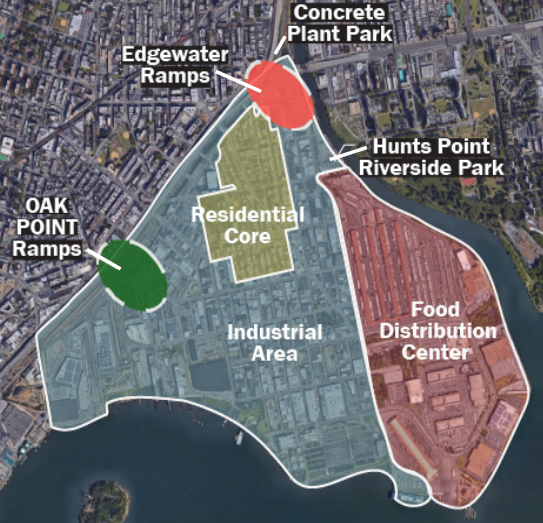 Neighborhood advocates have a better idea — place the Bruckner access ramps on Oak Point Avenue and Leggett Avenue, so truck traffic to the food market largely bypasses the residential blocks of Hunts Point and doesn’t threaten people walking to and from the Bronx River. That ramp configuration was endorsed by a joint NYC DOT/Department of City Planning study released in 2013. The city’s report was funded with a $1.5 million TIGER grant from the federal Department of Transportation, where current NYC Transportation Commissioner Polly Trottenberg was then a senior policymaker. The state DOT never closely evaluated the Oak Point Avenue option, however, rejecting it in favor of the Edgewater ramps. The least laughable excuse given by state DOT is that the Oak Point ramps would require building support structures in a railyard used by CSX and Amtrak. Putting the ramps on Edgewater avoids those negotiations. But the state should have to account for City Hall’s wishes as well. By law, the state DOT can’t build projects within New York City without the leave of city government. 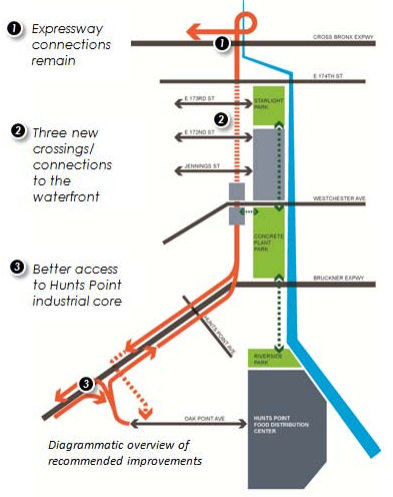 If the mayor wants to negotiate for a Bruckner ramp plan that reduces the impact of truck traffic on Hunts Point and improves access to the riverfront, he can. The question is whether de Blasio, who has passively watched the state’s Sheridan/Bruckner plan unfold until this moment, cares enough to use the leverage available to him. One veto belongs to Parks Commissioner Mitchell Silver. In order to build the Edgewater ramps, the state DOT needs to acquire a 13,191-square-foot parcel of Concrete Plant Park from the Parks Department. The Edgewater ramps would cast a permanent shadow over a portion of the park. Nevertheless, last October, the Parks Department sent a letter to the state DOT supporting the transfer of this parcel in exchange for improvements to nearby Garrison Park. It’s not too late for the city to change its mind. To date, no official action “has been taken by the City to transfer the parcel,” according to a Parks Department spokesperson. Even though the city has yet to sign off on these key approvals, state DOT has advanced far enough that some de Blasio officials believe their window to exert leverage has closed, according to a source briefed on City Hall’s thinking. As for de Blasio himself, he told reporters last week that the Sheridan Expressway removal is a “smart idea” to diminish the “isolating effects” of urban highways, and that he’s asked NYC DOT officials to flag any concerns. “I think for anybody in a community where their community is made whole and they can more comfortably get around to the waterfront, to parks, and not feel like a highway divides them it’s a better way to live, obviously,” de Blasio said. The mayor was speaking about the Sheridan coming down, apparently unaware of the new highway ramp the state DOT wants to build along the riverfront immediately to the south. There’s still time for de Blasio to avoid saddling the South Bronx with another slab of oppressive highway infrastructure. But sometime soon, the mayor will have to stop reviewing the state DOT’s plan and start driving a hard bargain on behalf of the residents of Hunts Point. The city, with the addition of other Grant’s and private donations, spent millions upon millions of dollars to create concrete plant park. It is a wonderful access point to the river with so much to offer. To lose space, lose light, and add trucks consistently rumbling across it is a total waste. I’m sure there is a better route to the money for Garrison Park, pun intended. The NYS DOT plan will exacerbate air pollution in a neighborhood where asthma rates are already sky high.